Toward the end of their Synchronicity tour, The Police had some fun improvising during a soundcheck in Buffalo. In June 1983, consummate new-wavers The Police released what would be their final studio album, Synchronicity, before launching an expansive world tour one month later. The Synchronicity tour, which began in Chicago, would continue steadily into early 1984, reaching nearly every major city in North America, Europe and Australia. During this time, The Police were arguably the most powerful and popular group in music—tickets for the tour quickly sold out, including those for their famous stop at Shea Stadium in New York in August 1983. The stadium was forced to open up the playing field for the audience, something it had never done before, allowing another 15,000 eager fans to attend. The six-legged tour would include more than 100 shows in total, all occurring between July 1983 and March 1984. 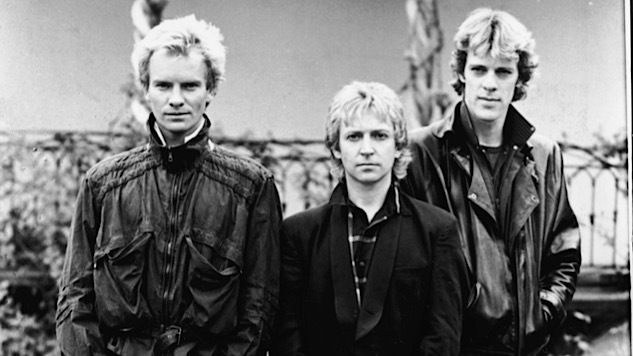 On Feb. 22, 1984, Sting, Stewart Copeland and Andy Summers stopped in Buffalo for one of the last shows. Needless to say, at this point The Police were familiar enough with their own repertoire that there was little need to rehearse. This rare soundcheck recording from before the show in Buffalo showcases an unusually relaxed side of the group, as they loosely improvise and wind through several versions of “Message in a Bottle” before doing a 1960s mashup including The Kinks’ “You Really Got Me” and Cream’s “Sunshine of Your Love.” The performance is loose and sometimes sloppy, but it is nonetheless enjoyable to hear The Police simply having some fun.